Kathleen Mae (Cornell) Litteral, 95, of Livingston, Montana. 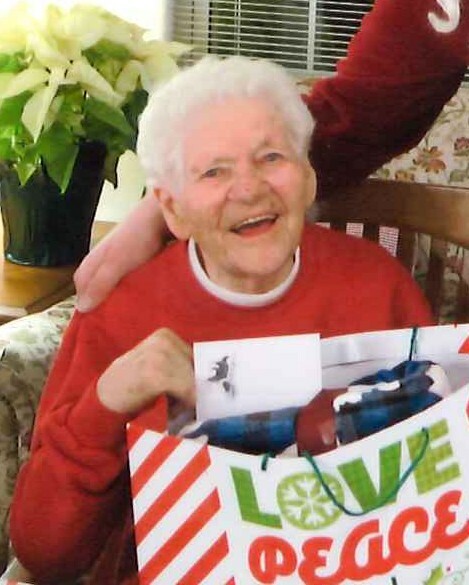 Kathleen passed away peacefully on Thursday, February 7th, 2019 at Caslen Senior Living. A memorial funeral service will be held 1:00 P.M., on Saturday, February 16, at the American Lutheran Church, 129 S F St, Livingston. Reception will follow at the church. Burial will take place in the spring, at Mountain View Cemetery. Kathleen was born in 1923, on April 16th, southeast of Watford City North Dakota, Kathleen had six brothers and three sisters. Her parents sent her to live with an uncle and aunt southeast of Alexander, ND at age six and she lived with them for seven years. At the age of 13 Kathleen moved back with her parents as they then had moved to a farm southeast of Alexander ND. This is where she graduated from 8th grade at Iverson’s Country School. In 1940 she was married to Kristen Lind and had 1 son, Kristen H. Lind in 1942. Her husband died in 1943, when Kristen, her son, was 13 months old and Kathleen was 18. She would again marry in 1947, to Kenneth Marmon in Sidney, MT and had 5 children. They divorced in 1958. Kathleen worked in several cafes as a waitress and cook in the Williston, ND area for several years. She then married again in the year 1961, to Richard Stordalen, had two more children and divorced in the year 1973. Kathleen moved to Livingston in 1970, she worked as a waitress and cook at Martin’s Café and later at the Husky Truck Stop. She retired in 1980. In 1978 Kathleen married James Litteral, he died in 1988, they had no children. Kathleen was injured in a hit and run accident on June 29th, 1981 which left her handicapped. She has been blessed with 22 grandchildren and 30 great-grandchildren and nine great-great grandchildren. Mom was a very good cook and she loved to bake her famous caramel rolls for her family. She made homemade cookies, dinner rolls and french bread for her church. She was also known for her fruit cakes during the holiday season. Kathleen is survived by her children, Sharon (Clyde) Mitchell of Glendive, MT; Dennis (Pat) Marmon of Williston ND; Beatrice (Eddie) Huber of Livingston, MT, Kenneth (Debbie) Marmon of Miles City, MT, Richard (Sheila) Stordalen and Michael (Nancy) Stordalen both of Livingston; daughter-in-law, Gloria Lind of Williston, ND. Nieces, nephews, cousins and other relatives and friends. She was preceded in death by her parents, Turby and Clyde Cornell and her siblings, Bessie Wells, Bill Cornell, Dan Cornell, James Cornell, Fred Cornell, Jessie Cornell, Alfred Cornell, Andy Cornell and Helen Chaney. Children: son, Kristen Lind, daughter, Carol Johnson, a grandson, Waylon Johnson; and a son-in-law, Neil Johnson.